These are tumultuous times for The Bar and whilst existing management structures and incumbents may provide the key services required, Esterase can provide a flexible and accessible strategic and business support service that will enable chambers to enjoy the benefits and access of a wider pool of expertise, but without the fixed cost and longer term commitment. But you may have heard of this before, consultants arrive, unsettle the natives, suggest a bunch of radical but often impractical solutions and pocket a nice fee. Goodbye consultant. Esterase is different. We’re committed to working with and depending upon the success of our clients. Our team is imbued with the same sense of frustration with the classic consultancy approach and we therefore aim to work with our clients with a commitment – both practical and financial – that is based on the success of ideas and implementations. We have recruited a team of exceptional individuals who can step in to assist with a range of crucial strategic and/or business development roles that support and enhance your existing structures and who share our collective views that a really effective legal consultancy needs to be one that retains ownership of its recommendations. The answer goes back to our founding partner’s (Alex von der Heyde) original background as a biologist and pathologist. ‘Esterases’ are enzymes (the catalysts) critical to the operation of the nervous system. Thanks to them our bodies work as well as they do. Esterase (the consultancy) provides a similar support role for organisations we work with. Esterase provides high level outsourced Practice and Business management solutions to organisations operating in the legal sector. We work with clients to develop strategic direction, provide business support services and assist with the implementation and delivery of processes and targets. Our primary aim is to help create, maintain and improve the infrastructure that supports our clients – individually and collectively. In this way we can free them up to focus on what they do best, representing their clients. We provide clients with flexible access to experts with experience across the legal (bar and solicitors) and wider commercial sectors. By addressing each client through a more rounded commercial prism, we’re able to provide a different type of legal consultancy and input. The Esterase team includes consultants with expertise in Chambers and Solicitors Practice Management, Operational & Business Processes, Finance, Compliance, Marketing and Facilities Management. We’re working with professionals in the legal sector and appreciate the challenges being faced across the profession. Our ability to draw upon a wide pool of expertise enables us to provide insight into how to foresee and manage future trends and challenges. Our mantra is about developing medium to long term relationships with our clients and helping them implement as well as understand the changes required. All members of our team have a track record in the practical delivery of strategic and business process change. Many chambers are at a crossroads with how to allocate and fund their executive management responsibilities in support of the clerking functions. Do you incur the heavy fixed cost of an incumbent, draft in disengaged consultants or consider sub-contracting out some functions to a longer term partner who invests in your success. Skill Base / Experience A candidate might provide CV evidence and confidence of managing in legal services environment but chambers reliant on actual performance. Can they add the value that role and salary demands? With a sole management consultant, benefits are limited by that person’s experience. Larger legal consultancies also tend to provide a narrow focus. Esterase has been created to provide a balance of legal & commercial experience. Core group consists of MBA executives, financial, marketing, business process and quality experts. Commitment The greatest benefit of employing an executive is their full time commitment to the cause. Visible presence (internally & externally) provides confidence of commitment. The question is how necessary is that full time presence in a modern chambers and does it deliver value? Little long term commitment. Most consultants work on agreed projects but lack ownership about delivery or buy-in. Esterase aim to become a leading supplier of outsourced legal services. Critical to our business plan is the development of long term relationships and to become a core part of clients’ business support strategy. The only way we can achieve this goal is by providing constant evidence of vale. Cost / Value Top level business managers/CEOs cost £100k pa + associated employment, recruitment and transition costs. Costs are open to specific instructions but with one off consultancy projects, where is the ownership, the KPI and ultimately the value? As mentioned, we aim to become the out-sourced business support function. This is not just a case of one-off projects but the development of a longer term relationship where costs are slashed but value enhanced. Is the traditional employment route the most effective? In the commercial world, out-sourcing expertise is a natural route. Why burden yourselves with a fixed cost that might not deliver? We understand that chambers operates on a very different footing (commercially and emotionally) to a corporate entity and that key clerking functions need to be ring fenced but why do the supporting functions need to be a fixed cost? As has been seen in the past. Consultants rarely offer more than a snapshot advice. Who then delivers? Where is the ownership? How many reports have been delivered and not implemented? The obvious benefit of using a consultant, including Esterase, is the flexibility and lack of long term cost commitment. As mentioned, where we’re different is in providing a hybrid service between the full time employee and a one off consultant. By providing you with a constant resource but complete control and flexibility. 2.3.1. Alex von der Heyde is the founding partner of Esterase and is an experienced business leader and practice manager, with experience of running companies across different sectors for 20 years. This extensive knowledge is further supported with an MBA from Cranfield School of Management, giving a significant depth of awareness of business management challenges. He has managed a number of professional services organisations including a Legal Consultancy and a niche Solicitors Practice, organisations with annual revenues ranging from £0.5 million to £36 million. 2.3.2. Andrew Weaver was a Barristers Clerk for many years, including 8 successful years as Senior Clerk to Lincoln House Chambers in Manchester. Andrew has since complemented these skills with an MBA (Cranfield) and numerous commercial consultancies and directorships. Alongside his natural common sense, he provides our clients with a unique mixture of legal services and commercial expertise. 2.3.3. Michelle Knight is an experienced Practice Manager who has worked in Solicitors Practices for the last 22 years. She has been involved with many areas of law including wills and probate, residential conveyancing, commercial property, family and Legal Aid funded work. Michelle’s experience has covered a diverse range of activities from facilities management, HR, finance, complaints handling and much more. Jonathan Wilkes: A Chartered Accountant with over 18 years’ experience as a finance director. Paul von der Heyde: A background of 30 years of experience as a Chartered Accountant and as the Senior Partner of a London based accountancy practice. Subsequently has acted as Chairman, CEO, Non Exec Director for a range of private and public organisations. Michelle Knight: A practice manager with over 20 years’ experience working in solicitors practices of various sizes. Barbara Spoor: A complaints management specialist who studied law prior to working for the Law Society. Helen Williams: A graphic designer with extensive expertise designing marketing, sales and project material (including tender documentation). Andy Miles: An experienced website developer with an impressive portfolio of past clients. He has significant experience of search engine optimisation. Ian Duncan: Has practised for 18 years in the property sector, gaining a broad range of experience of property management in both the public and private sectors. The implementation of this act is creating an impact on the legal market. The Bar may still be consulting about their new code of practice but the new SRA code of conduct, and the ability to set up Alternative Business Structures, is seeing movement amongst the solicitors. Increasing mergers and acquisitions as firms fight to consolidate their positions. While initial impact may be affecting Solicitors more than Barristers, there can be no mistaking that significant change is occurring. The passing of LASPO will have a major impact on those who provide legal aid support. Since the Jackson report, it’s been clear that the public funding of legal work will encourage major changes and cutbacks. There are also additional rule changes with regards to CFA’s. One obvious area of concern will be the “one case one fee” for criminal lawyers. As if solicitors didn’t have enough power. Another change is the rise of alternative solutions for dispute resolution. The pressure to reduce legal costs has led to alternative solutions such as Adjudications in the Construction Sector and an increased focus on Mediation. The overall effect is an ever increasing level of competition. New entrants with new sources of funding are offering alternative solutions for the provision of services. All those in the sector need to consolidate their competitive position and ensure they have a clear strategy to compete successfully. Key to any strategic thinking is how/where to increase margin. Where can we increase LT hourly rates whilst at the same time adapting a value add assessment of cost. This graph shows the effect of reducing margins on profit. 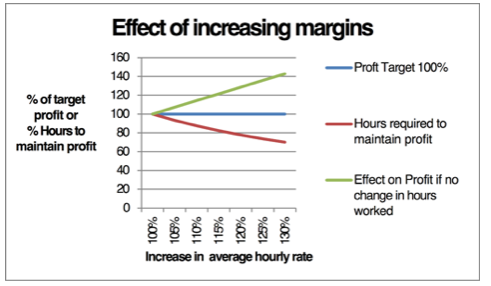 Even a reduction of 10% in the margins means that an increase of 16% in the hours worked will be required to maintain the same earnings level. We aim to move chambers towards better quality, more secure areas of work. To start leading rather than reacting to market forces and to enhance the overall service proposition by becoming “faster, smarter, leaner” in the way you deliver legal services vs. the competition. The talent at the Bar is clear. We want to help you take that clear message to a wider world. 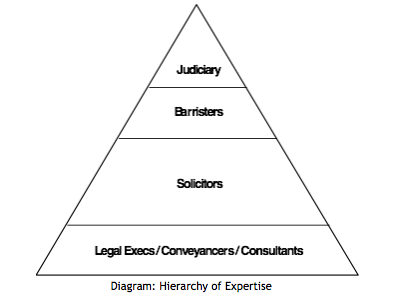 A generally accepted principle would state that while solicitors tend to be the generalists, barristers are the specialists. This expertise should be reflected in both control of work and in the fees chargeable in comparison other professionals. However this acknowledged proficiency is not reflected in the way that the provision of work is controlled. While the Legal Services Act 2007 is intended to open the market and will create major challenges for those working in this sector, it will also be a source of opportunity to those that have clear strategies. Barristers rely heavily on Solicitors for work and this principle is not going to disappear overnight. 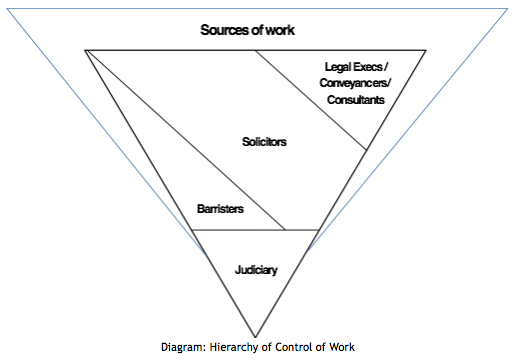 However all parties need to appreciate that the boundaries between Barristers, Solicitors and their sources of work will blur and change in the coming years. The balance of power will swing significantly in different areas of law. The increasingly competitive market, along with the changes in legal aid funding, will continue to tighten pressure on the hourly rate and margin. Fixed fees, increasing competition and LAPSO are all likely to increase that pressure. A barrister known to us, told by a solicitor that if he represented their client for free in the Magistrates Court then he would get the opportunity to represent the client if the case went on to the Crown Court. Effectively risking half a day’s fee earning work in the hope he would gain the future opportunity. This “offer” effectively means that if that work gets delivered, his overall hourly rate has already been squeezed + what premium on the “risk” of losing fee earning? Esterase can assist with analysing how/where to strategise your response to these threats. OK, we’re stealing a phrase from the wonderful Olympics Team GB manual but we’re realistic enough to know that trying to drive through sudden change – particularly at the Bar – doesn’t always work. Any strategic plan needs to acknowledge that change has to be incremental but attached to a wider strategic and business re-structuring, it can aggregate into the longer term changes that will help chambers and individuals adapt. When it comes to advocacy, we have a passionate belief that the Bar contains the talent but have at times failed to make that clear to a wider audience. However, change has arrived and will accelerate. So how do we go about implementing change? The emerging legal services landscape means that the skills required to represent clients are not, in themselves, a guarantee of success, particularly with the ongoing attack on fees and a seemingly endless shift in the balance of power. Long term viability is about adapting to the changing market by seeking new and innovative ways to manage, promote and finance a modern chambers. How can we support the existing team that enables them to concentrate on where they add real value? How can we challenge our competitors (immediate and distant)? What traditional fixed costs do we really need to retain? How can we mould traditional expectations with modern business practice? How do we make sure our talents & earning potential are not emasculated by the emerging landscape? In working with Esterase we can assist with any/all of these questions. Our ideal scenario is to sit in behind your core clerking team and provide them with any business support services appropriate to the individual case of each client. With the skills available within our team, we’re able to provide a level of sub-contracting expertise that enables you to restrict long term commitment and incumbent fixed costs. We can work with chambers to help explore and implement future change whilst the core clerks team focus on their crucial and value add services. One of the key areas is to look at how we can make incremental increases in margin. Over a period of time we can help to analyse and drive forward a plan to reduce costs (or at least providing a cost benefit analysis behind those that should be incurred) and increase hourly rates. Less work for greater return? 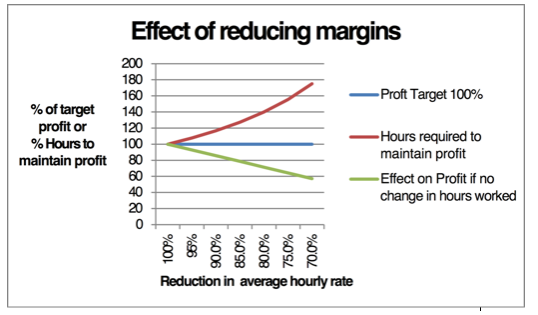 At its most basic, even a 10% increase in margin means the hours worked to achieve the same level of profit would decrease by 12.5%. Working smarter not just harder! One keen area of strategic interest is how chambers can take advantage of direct access instructions. How does chambers brand themselves to the market and if already in place, how best to drive forward a direct access strategy without alienating and cutting off current relationships and sources of work. Do you or your clerks team have the skill-set or resource to initiate and implement these kind of programs? Would it be useful to work with a team of experts who are prepared to invest their time into your success? Many chambers have already undertaken a strategic initiative to promote direct access but branding messages are confused and often it’s viewed from the outside as the token gesture it actually has been. With many chambers the website is full of content heavy biographies and a limited amount of relevant and/or core information that a commercial buyer of services might find useful. In marketing direct access, chambers have to think about what the commercial market wants/needs to make an assessment. How does direct access fit in with your wider strategies and/or aspirations? Esterase can help review and understand wider market implications before advising where best to resources – which we’ve also helped to streamline! We believe passionately in providing a different type of consultancy – one that combines chambers input and buy-in with an ownership commitment from Esterase. We are not the classic consultant who advises and moves onto the next client – this should be an iterative process where the consultant owns the advice being provided. For that reason, we attach some of our fee to that advice actually delivering results. We believe that this philosophy helps to cement an authority, integrity and buy-in with our clients. Assistance and management of capital investments including facilities and project management, IT infrastructure etc. Everyone recognises the need for change but the immediate challenge is how to balance addressing the uncertainty about tomorrow’s changes with managing the certainty of today’s diary. Can Esterase provide you with the external resource that enables you to find that balance without need for the cost and commitment of recruiting a full time manager? We believe this kind of structure will become the norm for the competitive chambers of tomorrow. Discard the heavy fixed costs and management expectations from the past and introduce the flexibility and accessible expertise of a modern commercial environment. Thank you for taking the time and consideration to peruse this document. It is intended as a very broad brush introduction to the concept and background to Esterase and the services we provide. We are clearly not privy to the challenges faced by your chambers and we would therefore be delighted to attend an initial meeting that enables us to understand more about where Esterase might be able to assist. Subject to that meeting, we would aim to provide you with a formal proposal that specifically addresses the requirements of your chambers.